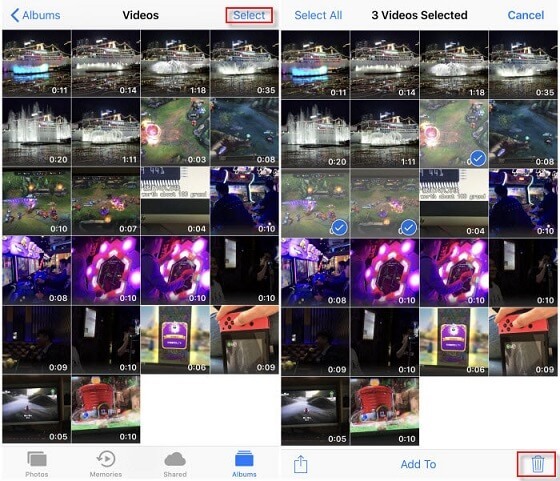 At times the user wants to delete videos from iPad iOS 12 and there could be many reasons. The main reason is that either the data has been backed up or the device storage has been made full. This tutorial has been solely written to answer the question of how to delete videos from iPad iOS 12. How to Delete Videos/Movies from iPad iOS 12? With one click clean, iMyFone Umate Pro or iMyFone Umate Pro for Mac is the only program that is even better than the iPad built in technology. It simply means that the user should get the program to delete the video files that are not required. Allowing this program to work definitely brings forth 100% result. Backup & delete videos: You can choose to transfer your videos to computer firstly, then delete all the unwanted ones in bulk. Completely delete videos from iPad/iPhone, making them 100% unrecoverable. Clean up 30+ junk files, temporary files, browser caches, cookies and clash log files from your iPad. Previews are available before you select and delete videos. Reclaim over 75% of photo space by losslessly compressing, with photo backup first. Fully compatible with iOS 12 and receive lots of positive reviews from macworld.co.uk, getintopc.com, pocket-lint.com, macbed.com etc. Step 1. From the download bouton, the program is to be installed ans launched. Once done the iPad is to be connected. Step 2. 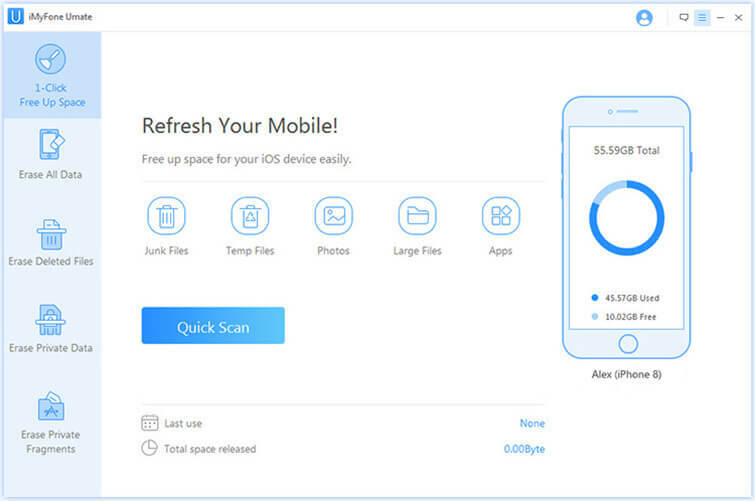 The “Quick Scan” is to be pressed to proceed with the device analysis, the program will list all the details and the space storage that can be saved. Step 3. 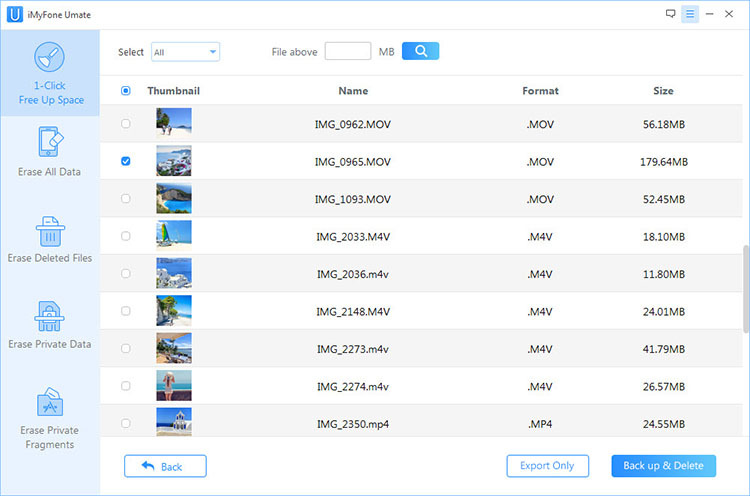 Once the user presses the Delete large files the program will list all the videos or movies. The user can select the videos that are to be deleted. The backup and clean button is then to be pressed and this completes the process here. The junk files, as well as photos, other large files can also be cleaned. 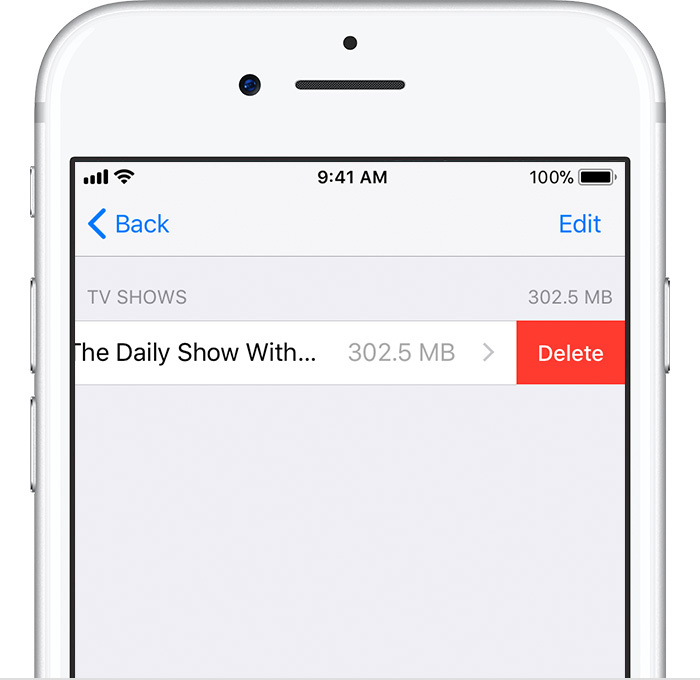 Once been cleaned, the user can then again see the amount of space that can be saved. Step 1. Connect your iPad to computer. Step 2. iTunes will automatically lauch to sync your iPad. Step 3. Click iPad tab at the top left corner on iTunes. Step 4. Click "Movies" at the left bar. Step 5. Uncheck "Sync Movies" or uncheck some unwanted movies. The apply button is to be pressed to sync the iPad. The process of deleting movis from iPad iOS 12 end here. Step 1. First of all, tap the Settings > General icon and access it. Step 2. On the next screen the user then needs to tap iPhone Storage. Step 3. Find the TV app or Videos app and click on it. Step 4. Tap "Edit" and click the red "-" button. Confirm by clicking "Delete" button. Step 1. Open the Photos app. Step 2. The camera roll is then to be accessed. Choose "Albums" from the bottom. Step 3. Tap "Videos" album to get in. Step 4. Tap "Selec" at the top right corner. You needs to select the videos that are to be deleted. Step 5. The trash icon at the bottom is then to be pressed to delete the videos. The videos will be deleted from the iPad iOS 12. The iPad iOS 12 is one of the most used devices of Apple Inc. There are several compatible video types for iPad. Below is a complete list of all of them.